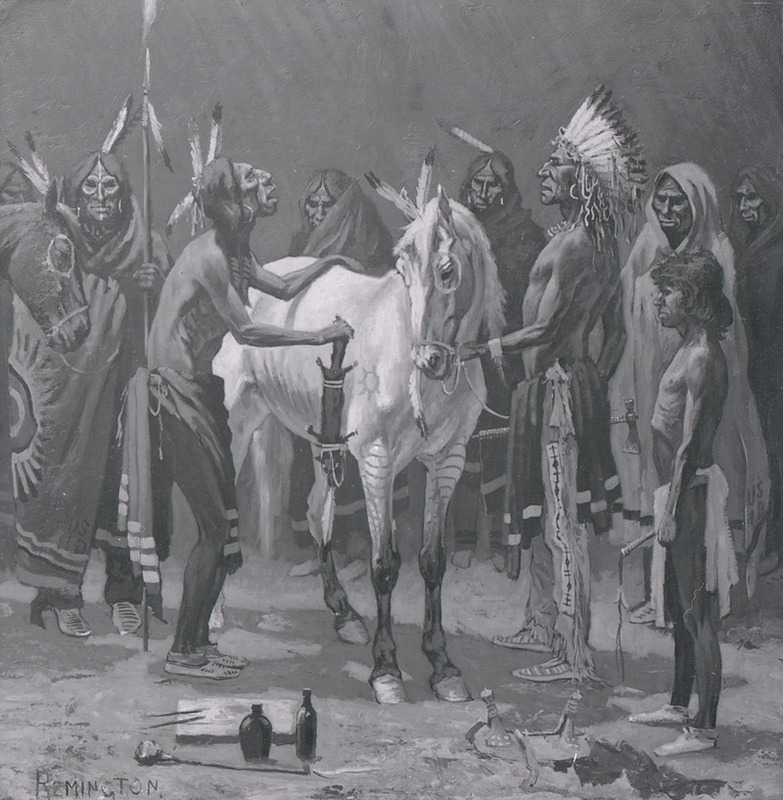 Depictions of American Indians and cowboys were Frederic Remington’s specialty, and he was considered an authority in bringing images of the West to the public. Remington was born in 1861 to a family that was engaged in local politics and the Civil War. He started off doing illustrations for popular journals and later moved onto painting. Vose Galleries has dealt with several of his works through the years. We have luckily had very few cases of lost works in general. However, this changed in June of 1969 when a shipment of 61 Remington drawings was mailed to Vose Galleries. The works had just been matted at a New York City framing company and were packed in a wooden box for shipment. However, the address listed- 162 Newbury, instead of 238- was incorrect. The box went missing en route to Boston. After contacting the shipping company several times and determining the drawings were most likely stolen, Vose Galleries was in touch with the Federal Bureau of Investigation. Vose also sent a list of the works to the Art Dealers Association in addition to museums and dealers nationally, in the event they were offered the pieces. In the aftermath, several promising leads appeared. An article from 1970 by Meryle Secrest entitled High Priced Art: It’s a Steal detailed the loss of multiple Hans Hoffman paintings. The firm associated with the case? The same framing company that last handled our Remingtons. The article stated that a man from the company had been sentenced to jail for another theft and that the missing paintings turned up on the West Coast with his brother. In the same year, Vose was also notified of Remington drawings being offered in Maine by mail, with only a Post Office box return address. After notifying the FBI of these developments, they were found to be unrelated to our case. A few years later in 1973, two more clues showed potential. A friend of Vose Galleries lost paintings on the same route, from the New York framing company to Boston. The FBI solved that case and found the thief that same year, so it seemed logical to assume that the same thief was involved. Unfortunately, he had no connection to our missing drawings. The last hint at a resolution was when Buffalo Bill Historical Center contacted Vose Galleries. They were offered two Remington drawings, but in conducting research on the works in the appraisal process, they could not determine their provenance. The man selling the drawings apparently received the works from a “television man” who had six or seven additional drawings, all not matted.